Jesus is sending his disciples out into a hostile environment. They will face great dangers. If they can stay completely grounded and not give way to their fear, they will achieve success. 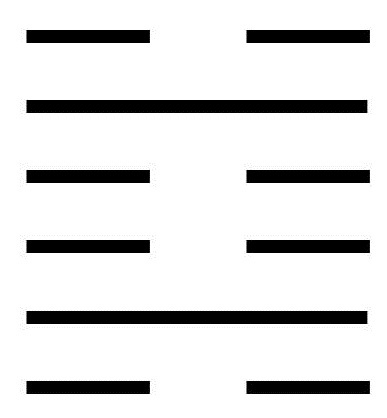 This hexagram consists of a doubling of the Chaos trigrams. The image of Chaos is Water, and its attribute is Danger. In the beginning, “the earth was a formless void and darkness covered the face of the deep, while a wind from God swept over the face of the waters” (Gen. 1:2). In the Christian creation mythos, the image of water upon water represents the ultimate in chaos and danger. With Chaos doubled, we also have the idea of danger repeated. Thus we are not just facing danger, but the repetition of danger. To recognize the danger one faces and not to shrink from what must be done. To understand the danger will be repetitious in nature and to take advantage of this by learning from the experiences. To circumvent the danger by remaining sincere and true to one’s inner values. To call on Wisdom for a deep understanding of the danger faced. To remember that sometimes danger can be turned into protection, as when a raging river provides a buffer from one’s enemies. To move slowly but surely through the danger and not become trapped in it. To understand the value of repetition and constancy in teaching others. A moving line in the bottom position warns against being seduced by the evil one faces. A moving line in the second position suggests that sometimes it isn’t possible to escape danger immediately. One must simply avoid being overwhelmed by the danger. Then one can weigh the possibilities and address the situation step by step. A moving line in the third position warns that there is no path that leads away from danger. Any attempt to escape will lead to deeper danger. There is nothing to do except wait until a path shows itself. A moving line in the fourth position suggests that this is not a time for ceremony; it is a time to embrace simplicity and sincerity. When enlightening another, the best place to start is with that which is most clear. Then proceed simply and logically from that point. A moving line in the fifth position advises that the way out of danger is to follow the path of least resistance. This is a time not to try to achieve great goals but to be content with escaping danger. A moving line in the top position is ominous. It describes one who is no longer grounded and has become lost in the trappings of Ego. From such a situation, escape is impossible.